Are you ready for Part 2 of Sherlyn's Blog Takeover? In this second installation of Choo Yilin X Sherlyn Chan, Sherlyn takes over our blog as she shares the thought process behind her jade bangle customisation. We welcome you to join us on this precious journey as we celebrate love, heritage, and becoming. There is just a special charm that appeals to me whenever I’m at Choo Yilin's Joo Chiat Atelier. Its heritage flavour and intimate setting draw me in completely, wrapping me in a wholesome experience that I don’t quite find elsewhere. That and my heart swells whenever I’m greeted by Dianty and her radiant smile. I will be sharing about bangle customisation at Choo Yilin in this Insider post. This is something many brides-to-be are curious about and an insight into the process might help you to make a better decision. 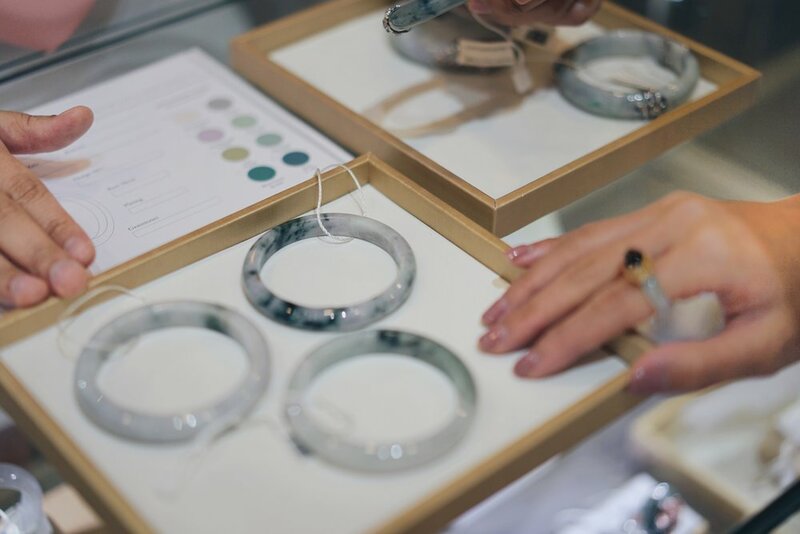 Customising a bangle at Choo Yilin teaches you a thing or two about jade and though I’m a graduated bride, I’m always up for a learning journey, no matter how brief. Like most of you, I am first drawn to the colour of jade, but characteristics such as evenness, clarity and translucency are features to consider as well. At Choo Yilin, you will be able to pick from many jade bangles of differing appearances. There will surely be one to capture your heart. This colour chart shows us a wide range of jade colours. As expected, there are different shades of green, but did you know that jade comes in lavender as well? Choosing your jade bangle is the first step to bangle customisation. Despite the wide selection, finding a jade bangle of your desired colour and size is not very straightforward. I was quite torn between a few and as fate would have it, I’m also a little in between sizes. In the end, I decided to go for one that looks more fitted. It can be worn loose at the wrist or cinched at the arm. Deciding on the thickness of my bangle also took awhile. Taking my frame into consideration, Dianty recommended that I go for a thinner bangle. Eventually, when I saw how the design I wanted looked on a thin bangle, I was quite convinced. Bangle designs are aplenty! Featured in this photo are the Classic Peranakan, Bamboo Trio and Peranakan Flower designs. While there are sterling silver pieces plated with gold, you can also opt for 9 or 18kt solid gold. There is even rose gold, which I what I picked eventually. Rose gold, I feel, compliments Asian skin very well. It has a warm tone and more of a modern touch. With just a few embellishments, a simple jade bangle can be elevated to take you from day to night. Isn’t the transformation just so amazing? This is the Peranakan Flower design. In each flower sits 5 gemstones, 1 in the middle and 4 surrounding it. Go for gemstones in your favourite colours or in your birthstones – white, blue, green, purple, pink or red. Wearing a jade bangle needs some getting used to but one thing’s for sure, it will stay safe and secure on your wrist! It also feels quite cool on the skin. I especially like how it can also paired with day outfits. A jade bangle is not just an accessory for occasions, events and dinners. Its subtle colour makes it a very wearable accessory. Now that I’ve finalised the design of my bangle, it’s time to patiently wait for it to be made. Stay close for the next post to find out the jade and gemstones colours I’ve picked. Meanwhile, take the chance and make an appointment to find out more about customising your own bangle! Visit us at our Mandarin Gallery Flagship Boutique for a complimentary jade bangle consultation. Due to the scarcity of appointment slots, we suggest making an advance booking through this form. We look forward to celebrating you.